Turlock and its surrounding communities need to address our growing homeless population. The needs are great, and the challenge is significant, but not impossible. No one wants to be homeless, cold or sick. Many homeless individuals are women and men who got lost in a depersonalized healthcare and mental health system; people whose lives changed when the economy took a dive and they lost their jobs. Others became part of a drug culture that has and continues to devastate their lives and the lives of their families and friends. Turlock has a handful of nonprofit organizations that have taken the lead in addressing the needs of the homeless. The City of Turlock has offered its assistance, too. The core of the problem? There is no plan. No single nonprofit agency or government agency has taken the lead in developing and implementing a strategy. Without a leader and a strategy, discussions continue to be circular, frustrations of downtown business owners grow, community members continue to raise safety concerns and homeless women and men do not know where to turn. Acting without research wastes resources and time that the homeless and the members of our community do not have to spare. Our success as a community will be insured by our ability to integrate long-term and short-term planning and to maximize available funding and services. We Care provides nighttime shelter for homeless men and housing solutions. The Turlock Gospel Mission has focused on caring for homeless women and families. The Salvation Army is taking care of whoever walks through their door. United Samaritans Foundation feeds people lunch, provides showers, outreach and food boxes; and the Turlock Gospel Mission offers free breakfast and perhaps additional meals. Haven Women’s Center provides care for homeless domestic abuse survivors and their children. Prodigal Sons and Daughters focuses on teenagers who may be homeless, using drugs or alcohol and treating adults for their addictions. These are all functioning organizations that are providing worthwhile services. Our community and the community’s homeless individuals, need them all. However, let’s look for a moment beyond the homeless community’s basic needs for food, shelter and safety. Are there training programs that some homeless individuals may qualify for? Are there housing programs to begin to help bring a sense of normality to the lives of homeless women, children, families and men? What is the role of Stanislaus County, and what have they done to help Turlock? The questions are endless. The frustrations continue to mount across government, business, nonprofits and those legitimately in need. Compounding these problems is the need for access to medical care and mental health services. While each of these steps is important and valuable, no one has stepped forward to take ownership of the issue and build a strategy to address the multiple problems faced by various stakeholders (or take ownership). It’s a new year. Let’s begin 2019 with a plan called, “Building A Better Turlock” which is outlined, below. Step One: Who is Serving the Homeless? If the Mayor and City Council want our help, Legacy Health Endowment wants to step up. To begin, we will lead an effort to survey the major programs serving the homeless. The survey will consider the services provided, the fundraising needs, the gaps in care and a recommended path forward. The survey would be transparent by working with a handful of leaders of homeless programs, the City, the Turlock Journal Editor and downtown business owners. This would help ensure that we are focusing on the issues that matter, the questions and answers that are being raised and considered and conclusions about how best to address the challenges we face. Recently, Legacy Health Endowment provided funding to the Castle Family Health Center and UCSF Fresno School of Medicine to launch a mobile healthcare clinic. Physician residents from the UCSF Fresno program are providing physicals, flu shots and other primary care services to ensure that people who need healthcare services have access. The EMC Health Foundation has funded a full-time mental health clinician to work with the homeless to begin to understand the kinds of mental health issues involved. Throughout the next few months, we will report to the Mayor and City Council on whether, and to what extent, there is a healthcare crisis for the homeless, as well as how it is being addressed today and tomorrow. In 60 days, LHE will present elected officials, business leaders, homeless advocates and the community with a report on our findings and very specific recommendations. It is long overdue to have a centralized food distribution strategy where individual nonprofits are not picking up the donated food and then being charged for it. This is a 60-day plan. Not perfect, but a plan, nevertheless. It allows all the stakeholders in our community to participate and it promotes and embraces transparency as we begin to move forward. Once the report is finished, we will offer to present the findings to the Mayor, City Council, City Manager and staff. — Jeffrey Lewis is the President and CEO of Legacy Health Endowment. The views expressed are his own. 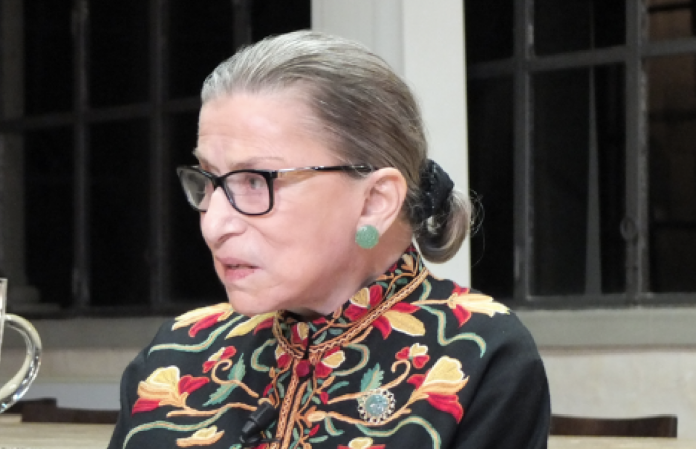 Today, Supreme Court Justice Ruth Bader Ginsburg, 85, underwent a lung procedure to remove malignant lung nodules. Doctors discovered the nodules during tests to treat rib fractures from a fall in November. It was not that long ago that it was rare to be diagnosed with lung cancer and live more than a few years. Now, with so many treatment options and tools to diagnose the disease more accurately, survivorship is on the rise. Early detection is more common for many diseases, including breast, colon or prostate cancer. Twenty nine percent of cancer is lung cancer – a staggering number. Massive advocacy and funding efforts have helped the public understand that with early detection, a cancer diagnosis doesn’t mean an absolute death sentence. Unfortunately, however, for the country’s deadliest cancer, lung cancer, early detection still only happens as a rare or accidental occurrence, even though lung cancer kills more Americans every single year than these other cancers combined. In fact, if you can catch lung cancer before it spreads, the likelihood of surviving five years or more improves to 55%. We are pleased that some insurers are covering early detection but we need to continue to push to ensure that it is available to patients. Currently screening is primarily for people who smoke. We now know that around 70% of newly diagnosed people either never smoked or quit decades ago. The instance of young people being diagnosed today is on the rise. These young people are never smokers, and many are athletes. Take for example Taylor Bell Duck, a 19-year-old collegiate soccer player. She was in the best shape of her life, but for some reason could not pass her school’s fitness exam. After numerous doctor visits with no results, the discouraged athlete assumed her best times were over and quit the team. After a spate of respiratory illnesses and numerous prescriptions of antibiotics from her campus’ student health services clinic, Taylor’s mother called the clinic and begged that her daughter to receive a chest x-ray. The clinic gave into the pressure, the x-ray showed a mass, but it was quickly dismissed, and neither Taylor nor her family were told about it – simply because she was a 21-year-old student. A few months later, stomach pain and suspected appendicitis landed her in the ER. A CT scan of her abdomen and pelvis showed she had a lung mass, a collapsed left lung and early signs of cancer. Taylor’s life was saved, but by an accidental discovery revealed by a CT scan ordered for unrelated concerns. Once early screening becomes routine, perhaps we can turn a ravaging cancer into a manageable disease, and luck will no longer need to be a factor in our approach to this disease. No one should ever be diagnosed with any cancer or disease that could have been prevented or, at the very least, interrupted before it becomes deadly. (SAN CARLOS, Calif. and RIDGEFIELD, Conn.)—For the second consecutive year, the Bonnie J. Addario Lung Cancer Foundation (ALCF) and Boehringer Ingelheim Pharmaceuticals, Inc., have come together to brighten lung cancer patients’ holiday season through the “Bring Hope Home for the Holidays” partnership. This program is helping lung cancer patients make holiday memories across the nation through December 20, 2018. With the support of ALCF, Boehringer Ingelheim volunteers are visiting lung cancer patients’ homes and bringing good deeds to families. To help raise their spirits during the holidays, the volunteers will help lung cancer patients with holiday activities, such as trimming the tree, wrapping gifts, writing cards or hanging lights outside of the house. Despite being the most deadly form of cancer, the stigma of lung cancer leads to underfunding. In fact, according to The Surveillance, Epidemiology, and End Results (SEER) Program of the National Cancer Institute, lung cancer is the number one cancer killer of men and women in every ethnic group in the U.S., taking more lives than breast, prostate and colon cancers combined. However, lung cancer research receives less funding than any other cancer, so it’s important to understand that eight in 10 lung cancer patients never smoked or quit smoking decades ago. The Bonnie J. Addario Lung Cancer Foundation (ALCF) is one of the largest international philanthropies (patient-founded, patient-focused and patient-driven) devoted exclusively to eradicating lung cancer through research, early detection, education and treatment. The Foundation’s goal is to work with a diverse group of physicians, organizations, industry partners, individuals, patients, survivors and their families to identify solutions and make timely and meaningful change and turn lung cancer into a chronically managed disease. The ALCF was established on March 1, 2006 as a 501c(3) non-profit organization and has raised more than $30 million for lung cancer research and related programs. For more information about the ALCF please visit www.lungcancerfoundation.org or follow us on Facebook or Twitter. (Sacramento, CA) – My Patient Rights and the California Chronic Care Coalition are urging California families to use visiting with family members during the holidays to make sure that they are aware of a new law taking effect in January 2019. The new law addresses the opioid crisis by requiring prescribers of pain-relieving opioids to also offer a prescription for the opioid-overdose reversal drug, naloxone to high-risk patients. AB 2760 was passed overwhelmingly by the California Legislature and signed into law in September 2018 by Gov. Edmund G. Brown, Jr.
(SAN CARLOS, Calif., Nov. 19, 2018) — The Bonnie J. Addario Lung Cancer Foundation (ALCF) recognized outstanding contributors in research, treatment and caregiving at its Simply the Best Dinner and Gala, which took place in San Francisco on Saturday, November 9. The annual event is a celebration of survivors, hope and determination that brings together lung cancer patients and their families to recognize top minds in the lung cancer field. The Bonnie J. Addario Lung Cancer Foundation (ALCF) is one of the largest international philanthropies (patient-founded, patient-focused and patient-driven) devoted exclusively to eradicating lung cancer through research, early detection, education and treatment. The foundation’s goal is to work with a diverse group of physicians, organizations, industry partners, individuals, patients, survivors and their families to identify solutions and make timely and meaningful change and turn lung cancer into a chronically managed disease. The ALCF was established on March 1, 2006, as a 501c(3) nonprofit organization and has raised more than $30 millionfor lung cancer research and related programs. The foundation has received four stars from Charity Navigator and has earned the platinum GuideStar nonprofit seal of transparency. For more information about the ALCF, please visit www.lungcancerfoundation.org or follow us on Facebook or Twitter. San Carlos, CA (November 15, 2018) – The Addario Lung Cancer Medical Institute (ALCMI), Champions Oncology and EGFR Resisters today announced the launch of a new study to create a novel bank of patient derived xenograft (PDX) models to help researchers better understand why patients living with epidermal growth factor receptor (EGFR) positive lung cancer develop resistance to treatment over time, or do not respond at all. (SACRAMENTO) – We Stand With Seniors, a statewide campaign focused on educating state leaders on issues facing California’s older adult population, congratulates Governor-elect Gavin Newsom on his victory. West Health and The SCAN Foundation, the nonpartisan, nonprofit organizations behind We Stand With Seniors, look forward to working with him and his administration on delivering on his campaign promise to “lead the charge” in developing and implementing a Master Plan for Aging that addresses the state’s looming senior care crisis. In the next decade, four million more seniors are expected to need health and supportive services throughout the state. The public infrastructure, already under tremendous pressure, cannot address the growing demand for these services without significant policy changes. Currently, one in five older adults in California lives in poverty. During the campaign, We Stand With Seniors called on state leaders to prioritize senior issues and collaborate on long-term solutions. As a result, during the campaign, Lieutenant Governor Newsom pledged to develop a Master Plan for Aging so all Californians can age safely and with dignity. West Health and The SCAN Foundation’s We Stand With Seniors…Will You? nonpartisan, public awareness and education campaign focuses on the specific challenges seniors and their families face in accessing high-quality, affordable healthcare, dental care and supportive services and the cost to the state if these challenges are not addressed. Keep up with #StandWithSeniors by visiting www.WeStandWithSeniors.org and following on Facebook @WeStandWithSeniors and Twitter @WeStandWSeniors. MACON, Ga – According to the Bonnie J. Addario Lung Cancer Foundation, one in fifteen people will be diagnosed with lung cancer in their lifetime. Sally Waldorf, a patient advocate nurse with Navient Health’s Peyton Anderson Cancer Center, visited Daybreak to talk lung cancer awareness.